The methods used to make coins has evolved over the years. Coins were first made in the ancient kingdom of Lydia well over two thousand years ago. The minting process for ancient coins was quite simple. A small lump of gold, silver, or copper was placed on a coin die embedded into a solid surface like a rock. The worker would then take a second coin die place it on top of it and strike it with a large hammer. Medieval mints used preformed round discs of metal and a screw press to manufacture the coins. Although this was a manual process, it was easier and yielded a more consistent quality than the ancient minting process. Modern coins are minted with hydraulic coining presses that automatically feed the blanks into the machine. When the machine is running at full capacity, rates of over 600 coins per minute can be obtained. This speed is necessary for an operation like the United States Mint that must produce billions of coins every year. Although the process is complicated because of the automation used to produce billions of coins, there are a few common steps that every mint around the world uses. 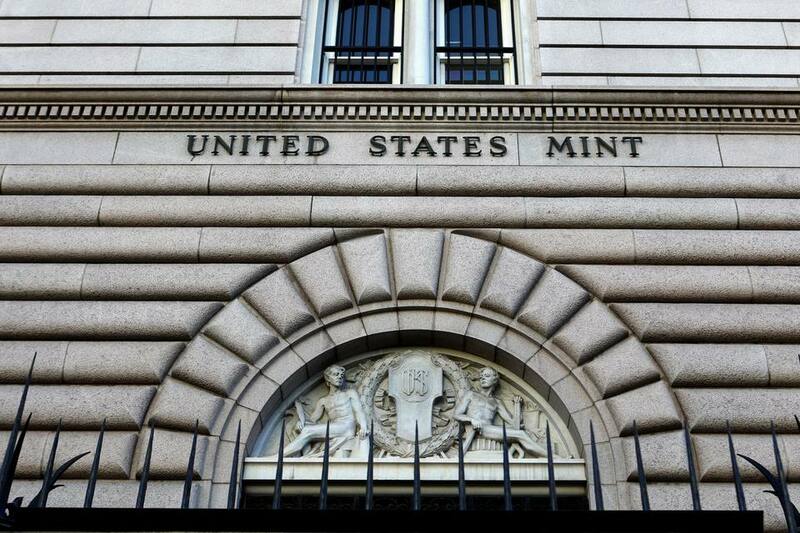 The United States Mint is the largest mint in the world, and we will focus on its production process. The minting process begins with the mining of raw materials. Mines from across the United States and around the world supply the gold, silver, copper, or other required metals. The raw metal obtained from these mines contains impurities that are not acceptable for coinage. The raw metal is refined to remove almost all impurities. Some coins require an alloy of two or more different types of metals. The refined metal is melted, and the additional metals as required by the specifications are added. For example, the United States Mint makes its five-cent coin from an alloy of 75 percent copper and 25 percent nickel. Once the proper purity or alloy is achieved, the metal is cast into an ingot. These are large metal bars which contain the proper amount of metal as required by the mint. The process of rolling the ingot to the proper thickness can be long and laborious. The ingot is rolled between two hardened steel rollers that are continuously moving closer and closer together. This process will continue until the ingot is rolled into a metal strip that is the proper thickness for the coin being made. The United States Mint uses rolls of metal that are approximately 13 inches wide and weigh several thousand pounds. The roll of metal is unwound and flattened to remove the curvature from the manufacturing process. It is then passed through a machine that punches out discs of metal that are now the proper thickness and diameter for the coin being made. Up to this point, the production process used to fabricate the metal blanks is dirty and is ran in a harsh environment. It is possible for small pieces of waste metal to get mixed in with the coin blanks. The riddling machine separates the properly sized blanks from any foreign matter mixed in with the coin blanks. The mint then passes the coin blanks through in the annealing oven to soften the metal in preparation for striking. The blanks are then put through a chemical bath to remove any oil and dirt that may be on the surface of the coin. Any foreign material can become embedded in the coin during the striking process, and it would have to be scrapped. To protect the design that’s going to be impressed on the metal coin blank, each coin blank is passed through a machine that has a set of rollers that get a little bit smaller and imparts a raised metal rim on both sides of the coin blank. This process also helps ensure that the coin blank is the proper diameter so it will strike up properly in the coining press. After this process, the coin blank is now called a planchet. Now that the planchets have been properly prepared, softened, and cleaned, they are now ready for striking. Business struck coins are automatically fed into the coining press at a rate that can reach several hundred coins per minute. Proof coins made for collectors are fed by hand into the coining press and receive at least two strikes per coin. Coins that pass inspection are now ready for distribution. Business struck coins are packed into bulk storage bags and shipped to The Federal Reserve Bank for distribution to local banks. Collector coins are placed in special holders and boxes and shipped to coin collectors around the world.